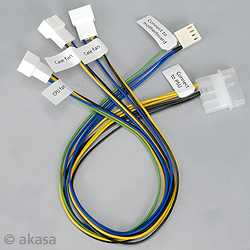 Combining the power of a PSU molex connection with the versatility of a PWM motherboard connection for the very first time the Akasa AK-CB002 is a unique product furthering the cause of quiet efficient computing. Supporting three PWM fans from a single motherboard header makes this the ultimate fan splitter for today’s low noise performance systems. Case fans and watercooling radiator fans can now benefit from smart and precise PWM control alongside the CPU fan. Utilising the intelligence of PWM for three fans enables multi fan connection and usage of more powerful fans while allowing their speed to be synchronized with CPU load. RPM feedback for the motherboard is provided from a connector marked CPU fan. Combined with akasa Smart Fan series fans (PWM enabled) it is a smart and easy solution for building quiet performance systems. “Indien je pc veel koeling vergt, dan is dit misschien wel een handig kabeltje.“ more..
“…queste ventole PWM e con l'adattatore AK-CB002, possiamo avere un sistema di ventilazione silenzioso, ma che all'occorrenza, fa girare più aria all'interno del nostro case...” more..